Product #20864 | SKU SAMXP144FX | 0.0 (no ratings yet) Thanks for your rating! A low-noise, high-headroom analog mixer. 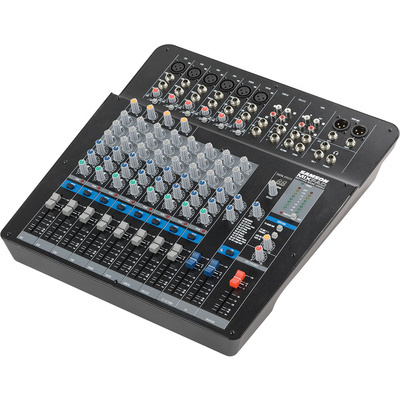 The MixPad MXP144FX 14-Channel Analog Stereo Mixer from Samson offers six MDR mic preamps with four of the channels equipped with single-knob compressors. All channels on the MXP144FX are controlled via precision 60mm faders and feature a 3-band EQ, Gain trim, high pass filter and mute switch. In addition, each channel on the MXP144FX has a pre-fader Aux send for your monitor mix and a post-fader Aux send for introducing external effects. With 100 24-bit, low-noise digital effects, the MXP144FX mixer offers a studio-inspired effects processor to give your mixes a professional touch. The mixer also feature a high-integrity, bi-directional USB connection for recording a mix to your favorite DAW or integrating digital music files from your computer into a project. The mixer features selectable 48V phantom power allowing you to mix in the warm, natural response of your favorite condenser microphones. Further catered to live performance, the MixPad includes brightly colored knobs, as well as 8-segment LED level metering for safe and efficient operation in dark environments.